Looks like the kevyip will be getting some friends! Well, briefly. WOW. I'm sure Tony Rayns' introductions will be exemplary, but these three films really cry out for some documentary supplements and commentaries to flesh out the complex allusions and storylines in these films. Absolutely fantastic! The US DVD editions of these films were not that great quality (and almost unwatchable for such vibrant films) even at the time of their release over a decade ago. And I don't think they've ever been released in the UK at all. Last edited by colinr0380 on Mon Mar 20, 2017 2:02 pm, edited 1 time in total. Are these new restorations ? beamish13 wrote: WOW. I'm sure Tony Rayns' introductions will be exemplary, but these three films really cry out for some documentary supplements and commentaries to flesh out the complex allusions and storylines in these films. I also hope we get complete subtitles for these. The songs weren't translated on the 35mm print I saw last year, and they're such a prominent feature in the first film that I can't imagine they're inconsequential. This should be a great rescue. Surely the transfers and subs will be completely redone, and I am hopeful that there will be sufficient context provided by whatever the final roster of extras prove to be. Another unexpected but very welcome release in a year that is already proving to be full of them. Honestly, I don't even need special features. Having these with good transfers is more than enough. Early contender for release of the year. Finally in 1080p. Time to throw out the Japanese Blu-rays if you have them! Just to let you know, I've just spoken to Arrow and they advised that you keep an eye on their Facebook page for updates on the special features as more will be revealed. If you don't follow it already, it can be found at https://www.facebook.com/ArrowAcademy" onclick="window.open(this.href);return false;. The set will be limited to 3,000 in the UK and 3,000 in the US, and it's unlikely that all of the films in the set will be released as a second pressing. Hope this answers all of your questions! Very glad I held off buying the Japanese set. I bought the Japanese set a while back -- but haven't yet done more than take a peek at how the films looked (comparted to their 35mm selves). 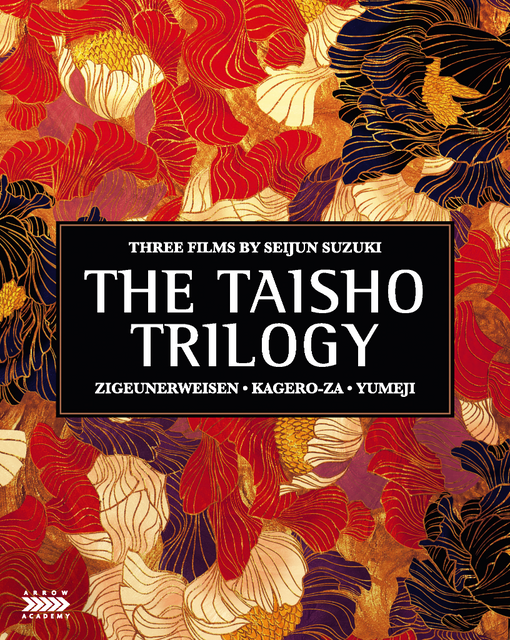 Ribs wrote: the films in the Taisho Trilogy are considered Suzuki’s masterpieces in his homeland. I've never heard of these films before - is this just hyperbolic copy or are these films regularly considered better than Branded etc? Not hyperbolic, as they say "considered...in his homeland": Branded to Kill and Tokyo Drifter are far more prized internationally and have cool and easily recognizable crime genre tropes, while Zigeunerweisen, for example, was a huge domestic success but wasn't really distributed internationally. The Kino/Kimstim DVD release of the trilogy didn't make anything close to the impression in the West that Criterion's earlier Suzuki DVDs had. Delayed until the 3rd of July. Delayed three more weeks to August 8. One delay per film it seems. Until they add a fourth unrelated film to the box, delaying the release until September. Making it a complete collection eventually. What A Disgrace wrote: Until they add a fourth unrelated film to the box, delaying the release until September. Don't you remember Raising Cain? It would be a delay of at least 5 months, pushing into 2018. What A Disgrace wrote: Delayed three more weeks to August 8. Arrow site and Amazon UK both saying July 24th. Or do you mean the US set? I just got a shipping notice from Amazon UK. Are there any reviews of the set online? I haven't seen any.